Where in the world can you live in a rural setting with spectacular valley and mountain views stretching before you, and with parkland on the edge of your property, while being just minutes away from the downtown core. Welcome to the luxury community of Highpointe. This prestigious inner-city gated community provides a tranquil oasis on the edge of the city, where many of the neighbours are the local deer, the occasional bald eagle or red kite, and perhaps, on a moonlit night, a coyote or two that can be heard calling in the distance. Gated and secure, Highpointe is an ideal setting for luxury homes. The existing homes are designed by leading architects and display an interesting array of styles, from Modernistic designs to traditional French Country, Tuscan, and Contemporary. This charming neighborhood is a rare find so close to the convenience of the city. Ideal for retirees and families with children who engage in extra-curricular activities and want to be close to amenities, while enjoying a peaceful country setting. 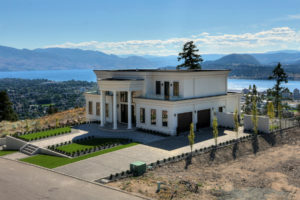 Jane Hoffman Group listings show a variety of homes for sale in luxury communities, if you have any questions about a listing or would like to know more about the neighbourhoods in Kelowna, please do not hesitate to contact us. A beautiful home in a highly-desirable location. 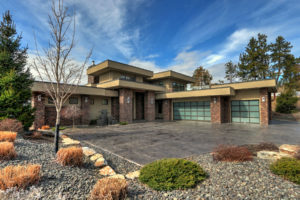 The Tuscan inspired design brings a european flair to this prestigious neighbourhood, but the views of the valley are wholly Okanagan, with miles of vineyards, golf courses, Ponderosa Pines and the lake stretching before you. This stately home provides a 360 degree view of the valley. Private and luxurious in every detail, this home includes an outdoor pool and professional indoor gym, triple garage and opulent en-suite spa. The setting provides spectacular lake views and city lights by night. This luxurious modern contemporary home features endless windows to capture the views. The crisp and clean-lined exterior is accented with stone. Minimalist styled interior perfectly blends global surfacing elements softened with the warmth of wood. Majestic Villa perched upon a unique site affording a panoramic view of lake and city. Recently built, this home was designed to capture the setting and offer an entertainer’s delight from the grand patios, pool complete with bar access, home theater, wine display room and luxury guest accommodations.